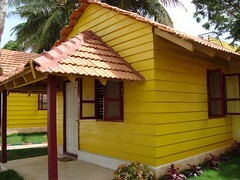 The Karnataka tourism has encouraged to set up the “Home Stays”. A Home Stay as the name suggests is an accommodation option where in tourists are offered quality boarding and lodging in your homes at an affordable cost. A vastly popular concept world wide, home stays are the perfect solution to cater to today’s discerning tourist who prefers to experience a slice of life of the land that he is visiting. Shorn of all the frills of star-rated hospitility, home stays add a personal touch to the travel experience given our rich tradition of hospitality, a home stay is the best way to show case the quintessence of Karnataka. “aaradhana” is situated adjacent to Varuna Aqueduct, hardly 1/2 a KM drive form Bangalore-Mysore tollgate on the ring road at Hale Kesare Village, in the midst of a coconut groove, which brings the homely atmosphere caters to your need to be in the warmth of “mother nature”, adores your arrival with its beautiful garden. Five wodden structured, tiled roof cottages, Mini Conference hall, well furnished with attached bathrooms, hot and cold running water facility for all the 24 hrs., a dinning hall, Separate beds, Common bathrooms and Toilets available. Arrangements will be made on prior orders. Bus Stand: 5 Kms (Approx).